We left at our usual time of 5:30am. This gets us out of the L.A. area before everyone else decides to leave town too. We headed up Interstate 15 and we were in Las Vegas, Nevada before 10:00am. The drive from Barstow, California to Las Vegas is one of the most boring drives I have ever taken. There is very little to see, even by Mojave desert standards. We passed through Vegas without stopping, choosing instead to use a rest stop just west of the Nevada town of Mequite to take a break. Mequite is an odd place, consisting almost exclusively of gambling establishments, set up to cater to the Mormans from Utah. Just east of Mesquite I-15 approaches the impressive Colorado plateau and crosses into Arizona. The highway goes through the impressive Virgin River Gorge. The walls of the gorge are steep and the river is fast flowing. There is only one town along this stretch of I-15, Littlefield, Arizona. It might as well be in Utah or Nevada, however, since you must cross into either state to get to anyplace else in Arizona. There are no paved roads leading from Littlefield to anywhere in Arizona. We stop in St. George, Utah for lunch and fuel. Our Corvette gets around 27 mpg on long interstate runs like this, even at 75mph, enabling us to comfortbaly drive about 400 miles between refuelings. We generally stop for a meal or a short rest after about 300-350 miles. After lunch we continue to pound out the miles through Utah, passing through some very pretty country south of Salt Lake City. Don't ask me why, but the view you get of Salt Lake City from I-15 is dismal. The city just looks very unattractive. Despite passing through here several times, we have yet to stop. It is getting late now and the sun is getting pretty low in the sky as we approach the Idaho border. Our target is the Holiday Inn at Pocatello, Idaho. We stayed there on our last trip through Idaho. It is, I think, a safe bet. Unfortunately, after we arrive, we discover that the only rooms available are in a section which has just been constructed. The smell of paint is so strong in the room it is impossible to breathe. 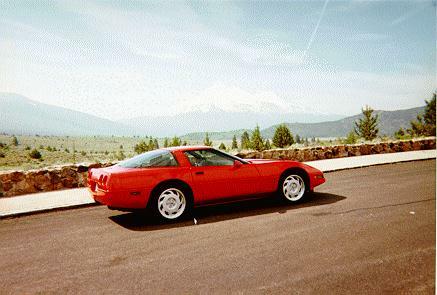 So we pack the Vette again and head for Idaho Falls, about 100 miles further up the road. I don't like driving at night if I don't have to, but there is no other choice. We lost what little daylight was left searching for another vacancy in Pocotello. When we arrive we check into the first motel that offers a vacancy. It is not until the next morning that we discover that we are right next to the river. It is a beautiful view. We leave Idaho Falls at around 8am, late for us, but it did feel good to sleep in after the long drive of yesterday. We continue north on I-15 through the pretty Idaho countryside. There is no road construction in progress here on I-15 so we make good time. Before long we cross the Montana border at a ghost town named Monida. 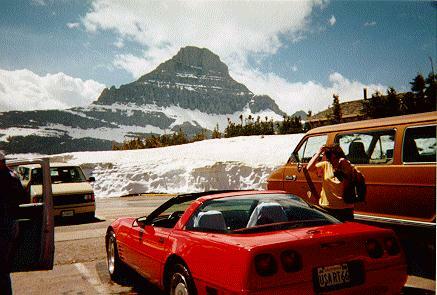 At the next rest stop we decide to remove the Corvette's targa top and enjoy the sunshine. We continue on under azure skies toward Butte, Montana, our next stopping point. We eat and refuel in Butte, and then head west on I-90 towards Kalispell, where we will overnight. We pass by a huge lake on our way to Kalispell and debate whether to rent a power boat and tour it tomorrow. We decide to wait and see what happens. We found a nice motel in Kalispell and after unpacking we took a walking tour of the downtown area. 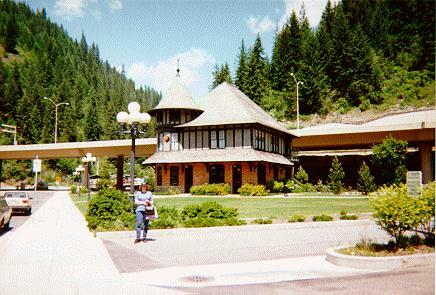 It has a number of old buildings that are probably on the National Historic list, including the Railroad Station. The town is pleasant and clean. We headed for Glacier National Park under sunny skies. After a short drive we entered the park and the first place we stopped was a turnout along and stopped to admire was Lake MacDonald. At this point, sice the weather was so pleasant, I decided to remove the Corvette's targa top again. What I didn't realize at the time was that there was water running off the sides of the roadway above our heads, so I had to maneuver to remain dry. We continued along the Going To The Sun Highway, and stopped at the National Park Service Headquarters to view the exhibits. It was suprisingly cold. You can see the snow, and the Corvette sans top in the parking lot of the vistor center. There was 20 feet of newly fallen snow on the ground, and we found out just before leaving our motel that the road was only opened to traffic the day before. The scenery here is not to be believed. The air is clear and fresh and the view stretches for miles. The mountains are steep and void of any apparent vegetation. The sky is a deeper blue, bordering on purple at this altitude. We continued driving east on Going To The Sun Highway and when we arrived at Lake St. Mary, we decided to take the boat tour. This is a glacial lake, and is therefore freezing cold, even at the height of summer. The water is a translucent green, due to the mineral runoff. The surrounding peaks are steep and jagged. The drive back to Kalispell is a long one, since we must skirt the southern edge of the mountains that make up Glacier National Park. It was early evening when we returned to our motel in Kalispell. We headed north for Canada, with logging trucks whizzing by us. We stopped at a truly funky place just this side of the Montana/Canada border for breakfast. This place smacks of militias, tax revolts, and all around paranoia. This is not a good place to have California plates. We finally crossed into Canada and I am impressed with the granduer of the place. You have no idea just how big this country is until you drive across it. Mountains on the distant horizon seem to stay there, no matter how long you drive. The Vette has the capability to display speed in kilometers per hour which comes in handy here. I like to know just how far over the speed limit I am at any given moment. All the signs are bilingual, and the traffic signs show metric speeds and distances. It is foreign, but familiar. We refueled at a town called Cranbrook, in British Columbia, and then proceeded towards Banff, in Alberta. This circuitous route was made necessary by the Canadian Rocky Mountains. As we approached Banff, we noticed that visibility was worse than in L.A. We suspected forest fires, and sure enough, after we have paid for three days of fun in Banff, we discovered that visibility will be zero for dyas because of numerous forest fires in Alberta. We stayed in for all of about two hours before heading east for Calgary. What followed was a nightmare. We arrived in Calgary towards dusk. There ws just enough light to make out the Saddledome (the hockey arena) and some other landmarks familiar to us from the telecasts of the 1988 winter olympics. We headed south through Lethbridge and on to Great Falls where we spent the night. We left Great Falls early and headed west on Montana route 200 to Missoula where we again picked up Interstate 90 westbound. A truck kicked up a rock which put a big chip in the windshield of the Corvette. That was $800 worth of damage. We traversed some ruggedly beautiful country, heavily forested and green. 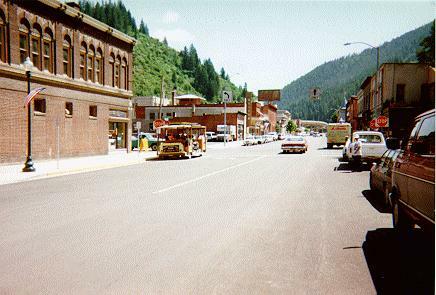 We passed through Wallace, Idaho, filming location for Micheal Chimino's 1980 movie Heaven's Gate. We pass through on our way to Coeur d' Alene, Idaho. 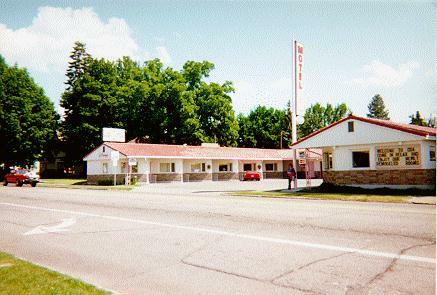 We find lodgings at the Pink Flamingo Motel, a 1950's court style motor hotel where you park your car directly in front of your door. I like that so I can keep my eyes on the Corvette. The place is right out of the '50s, from the architecture to the colors. I expected Elvis to show up any minute. After unpacking, we took a walk around the town, and wound up down by the lake. I was amazed that my cell phone worked there, although I don't know why I was so naive: the place was bustling with affluent people. Coeur 'd Alene is probabaly one of the best kept secrets rich people have. And make no mistake, there are alot of rich people in this town. The houses which surround lake Coeur d' Alene are monstrously expensive. 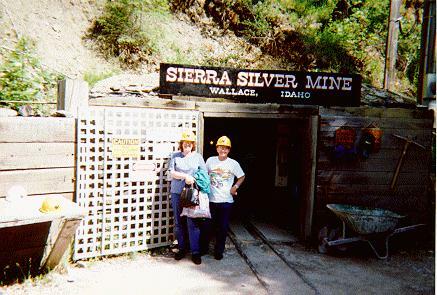 We decided to motor back to the town of Wallace in order to take a tour of the historic downtown area and a local silver mine. The town is nestled in among some steep, heavily forested mountains, and has a nice feel to it. 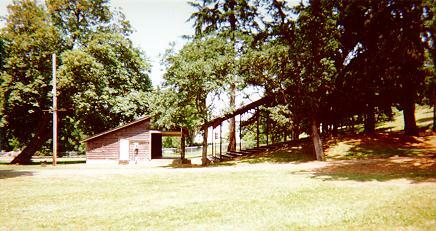 The railroad station was restored and moved when I-90 was constructed over the original site. The station appeared prominently in Micheal Chimino's epic movie "Heaven's Gate"
Jane wanted to see Palomino horses, so we journied south to the town of Moscow, Idaho, and the world famous Palomino Hall of Fame and Petting Zoo. Afterwards we drove south through Clakston and Lewiston, and Walla Walla, Washington, before heading into Pendleton, Oregon. 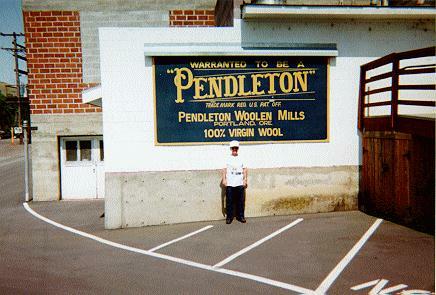 After a tour of the Pendleton Mill and a stop in their gift shop (where we buy some shirts, a jacket, and a woolen blanket) we head west on I-84 through the Columbia River Gorge. From just southwest of Lewiston until just east of the Dalles in Oregon, the area is harsh and desert-like. West of the Dalles it gets green and lush. We stopped at Bonneville Dam, which is an impressive sight, to stretch and drink some water, and take this picture. At Portland we turn south on I-5 and begin heading for Albany, Oregon. The traffic is heavy and everybody wants to to excerise their constitutional right to drive at 55mph in the fast lane so I am constantly manuvering around slower traffic. We head for Sweet Home, since I'm convinced that this is where the Rob Reiner film "Stand By Me" (1986) was filmed. After some astute scouting by Jane, she discovers that the movie was filmed in Brownsville and Cottage Grove. We head for Brownsville along scenic Oregon route 228. It is a beautiful high summer day and the air is alive with fragrant scents from the surrounding fields and hills. We drive into Brownsville and are greeted with the same view of the town ("Castle Rock" in the movie) that is shown in the closing credits of the movie. We went to the Brownsville museum to get information on movie locations and discovered that we are not the first people to inquire about the film. They gave us a map that shows all the local areas that appeared in the film. 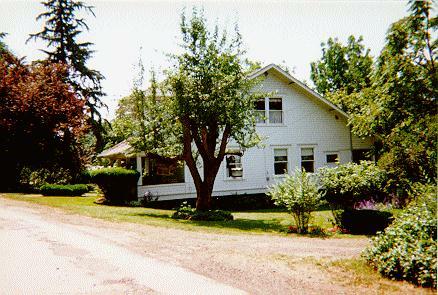 Our first stop was Gordie's House at 325 Fischer street. Our next stop was Pioneer Park where the pie eating contest was filmed. We tried to find the railroad trestle where the boys outrun a steam locamotive in the movie, but discovered that the railroad had torn up the tracks and demolished the bridge several years before. After leaving Brownsville, we headed for Crater Lake. This is the caldera of a volcano (Mount Mazama) that blew it's top several million years ago. The crater left behind was filled by rain and is today among the purest and clearest bodies of water on earth. 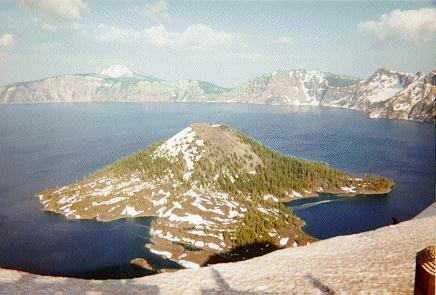 Offset in the caldera is a cinder cone left over from a geologically-speaking recent euption called Wizard Isalnd. As at Glacier National Park, there was 20 feet of newly fallen snow only recently cleared from the road. It was actually cold here and we donned jackets and gloves. While viewing the crater, we met a group of retirees on a motorcycle tour. They have Honda Goldwings, with all the requisite paraphenalia and we chatted with them about traveling the US. They seem to have been damned near everywhere we've been, and on this trip they are doing almost exactly what we are doing, only in reverse. We left the mountains and descended to lower ground and headed for Klamath Falls. This is where we planned to overnight, but once again we had trouble finding a motel. We caught a break and found one next to a restaurant. This stretch was pretty uneventful and relatively boring except for a pleasant rest stop on highway 97 near Grass Lake, Ca., and the view of Mount Shasta from the side of highway 97. 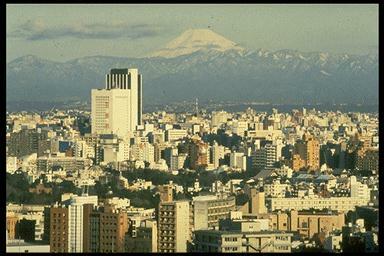 We found an even better view of Mt. Shasta as we drove along Hwy 97. We turned east on CA 44 in Redding and headed for Lassen Volcanic National Park but were turned away because the roads in the park had not been cleared of snow. Although this was the middle of July, the snow had still not melted and was still deep enough to require plowing. The state of California was pursuaded to purchase the Empire Mine, which had been closed by its owners because of falling gold prices. Some wags say the the state was taken in the deal. Since you cannot go into the mine itself, but can only visit and inspect abandoned buildings and rusted equipment on the surface, it doesn't seem to be a good deal for the state of the visitors. 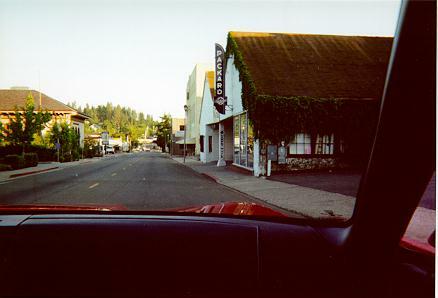 We left Grass Valley relatively late--perhaps 9am, and headed south toward Sacramento. We have been to the state capitol before, just two months earlier in fact, so we didn't plan on stopping. The capitol building itself is a handsome design surrounded by pleasant looking gardens. But Sacramento does not have a good feel to it. I don't care for the town much. I decided to take California highway 99 south instead of Interstate 5. I-5 is truly non-scenic, while Hwy 99 passes through some famous California towns, such as Stockton, Modesto, Fresno, and Bakersfield. This is the heart of California's Central Valley, the agricultural heart of the state. Finally, at about 7pm, we pull up into our driveway. We put 4,800 miles on the Corvette during this trip. It was well worth every mile.